The AutoApps Command System enables the AutoApps plugins (including Join, along with some specific 3rd party apps such as Snackbar) to communicate with Tasker, as well as communicate through Tasker, in order to have these plugins tell Tasker to do something (like perform a Task), or, simply send some data into Tasker. There are two “parts” to enabling your AutoApps Commands to function. These two parts resemble a Broadcaster, and a Receiver. 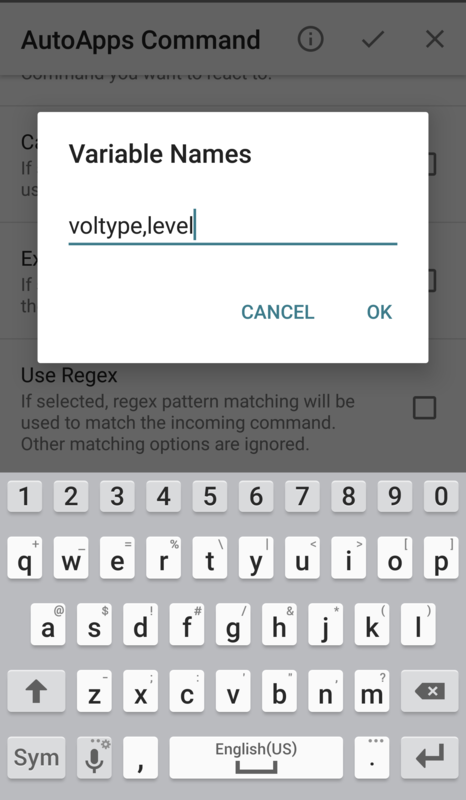 The AutoApps Commands are “Broadcast” into Tasker by whichever plugin sending the Command. You must then create an AutoApps Event Profile in Tasker to “Receive” or “listen for” your specific commands. 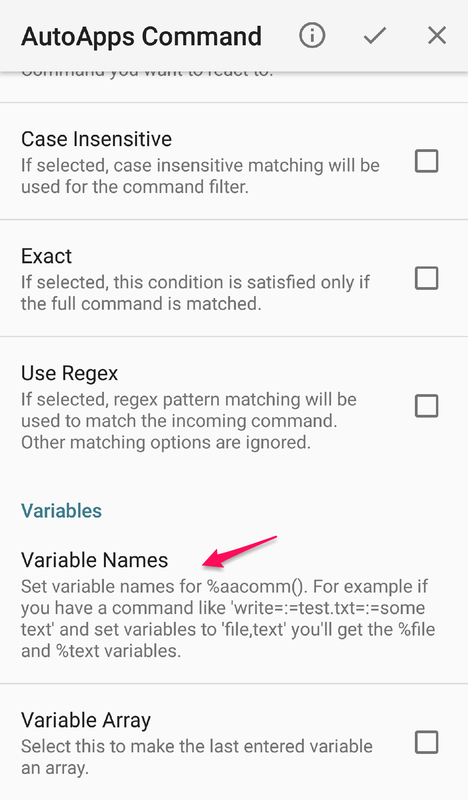 When that Event Profile detects any command(s) you configure it to receive – Tasker will run the Task you have linked to the Profile. That Task will also have some variables immediately available within the Task that contain data broadcast with your original Command. This could be used to set the media volume to 10. 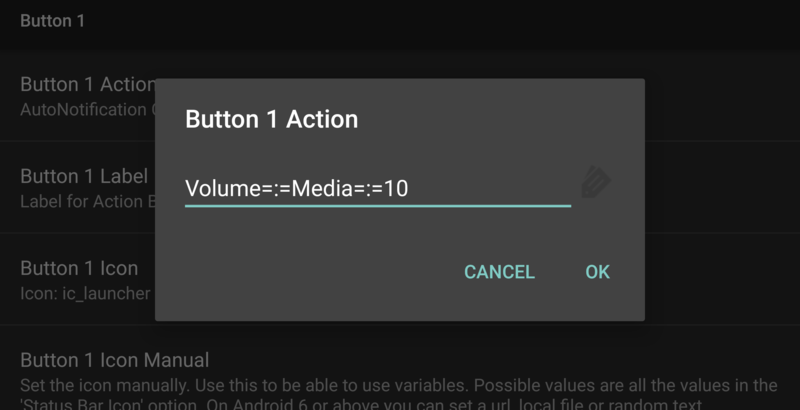 You could attach this command to an AutoNotification button, or an AutoBubble, send it in via Join, etc. Once you’ve decided on your exact Command words/syntax, and have put that Command into a plugin somewhere to be broadcast, you now just need to create an Event Profile to “listen” for it. Below that Command Field you’ll see some Advanced Options for using Regex, etc. and you can use these as you wish. Further down though you’ll find the Variable Section and specifically the Variable Names field. It is in this field that you’ll enter the variable names you want available in your Task. These will be the values that occur after every =:= characters, in the order they appear. 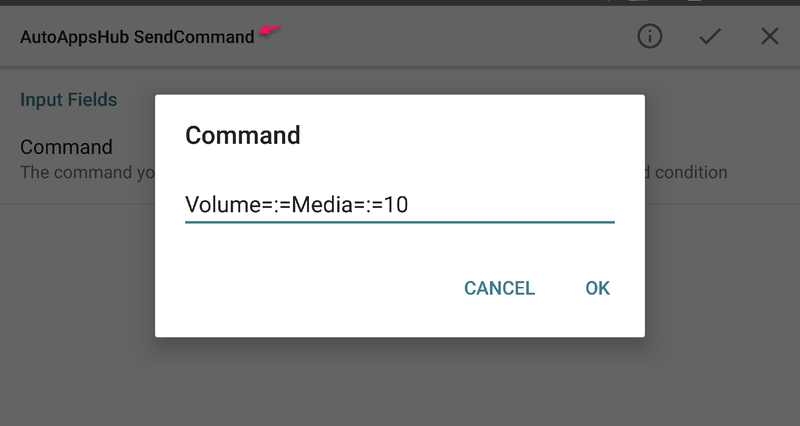 So for this example – we’ll say we want two varnames %voltype and %level available in the Task, which would correlate to the “Media” and “10” in the Command. 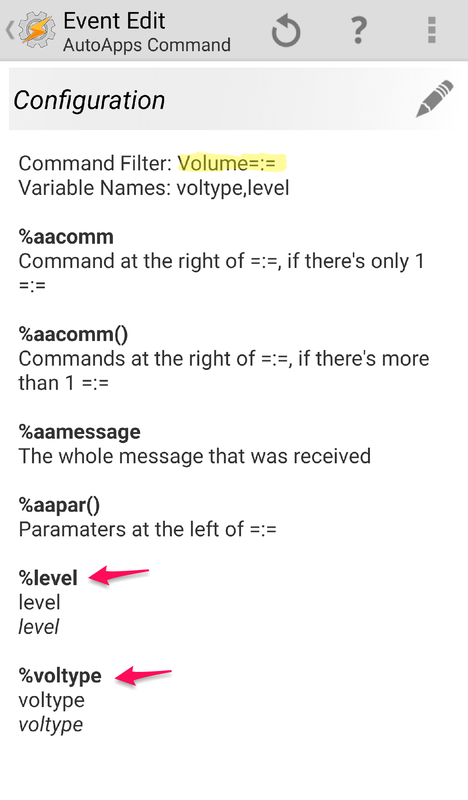 Therefore in the Variable Names Field enter simply “voltype,level” and this will have AutoApps automatically create the variables names %voltype and %level in the Task you link to this Profile. As you can see that Task above is checking for the %voltype specified in the Command, and then based on that value, it will set that volume to the %level being received through the Command Profile. 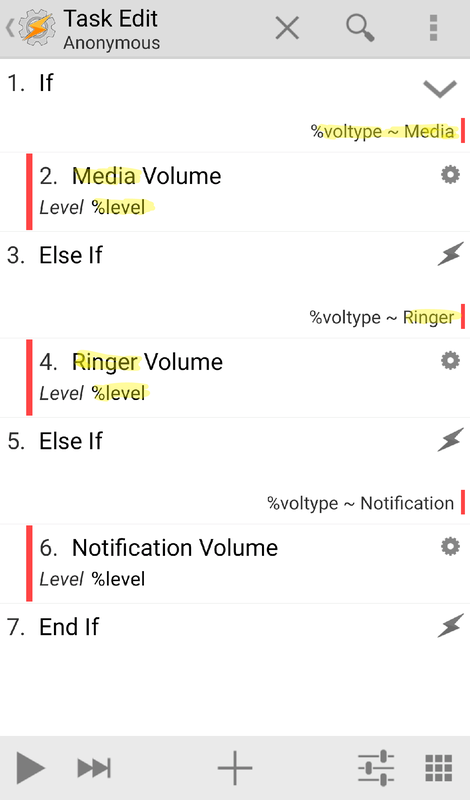 Simply send any of those commands from any AutoApp and Tasker will set the specified volume to the specified level. To test this example – you could simply link these three Commands to three AuotNotification Buttons in a notification you create. 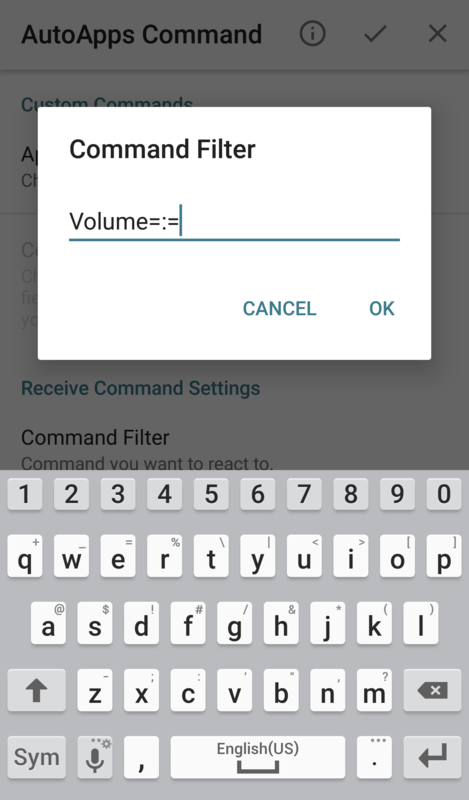 Or send those Commands to your device containing this Profile from another device via Join or AutoRemote and remotely set your volumes from another device! This guide was gently put together by Tasker Pro over on Reddit. If you want to further discuss aspects of this command system you can do so there or contact me directly via email, Google+ community or forum!